It runs on hydrogen power and will hit a top speed of 186 mph. Roland Gumpert, the German engineer behind the Gumpert Apollo supercar, is back with a brand-new supercar Earlier this decade, the Gumpert company faced financial woes but was salvaged by new investors in 2016 and transformed into Apollo Automobili, which is currently making the extreme . Gumpert left Apollo shortly after the takeover to embark on a new car project. At the Beijing Motor Show, Gumpert finally revealed what he’s been working on. Meet the RG Nathalie, a revolutionary electric sports car built as part of a partnership between Gumpert and Chinese electric startup Aiways. Powering the RG Nathalie, which is named after one of Gumpert’s daughters, in case you were wondering, are four electric motors. But they aren’t battery powered. Instead, the RG Nathalie uses a hydrogen fuel cell stack that generates the electricity to power the motors. 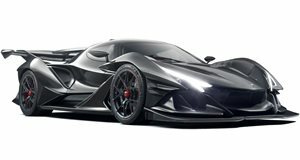 As hydrogen fueling stations ae in short supply around the world, Gumpert and Aiways have implemented a methanol reformer. This takes in methanol and is able to split it into carbon dioxide, which is released into the air while hydrogen is funneled into the fuel cell. With this setup, the RG Nathalie will accelerate to 62 mph in around 2.5 seconds and top out at 186 mph. Gumpert also claims the electric sports car will achieve a range of 370 miles – and that’s when driving fast. Drive more conservatively with eco mode enabled, and you can expect the range to nearly double. Like the Gumpert Apollo, the RG Nathalie’s front fascia is dominated by sharp lines and large intakes. It also has matte black wheels, an angular roof, and LED taillights. Deliveries for the RG Nathalie are expected to start in 2019, with pricing to be announced closer to launch. With its advanced tech, you can guarantee this revolutionary EV won’t be cheap.